"The one chlorella product I trust more than any other…"
As someone who is conscious about their health, you probably already know about chlorella. Chlorella is one of the most powerful super foods on the planet. It's one of the richest sources of protein, beta carotene, and nucleic acids. Ounce for ounce, chlorella offers more nutritional benefits than most plants or animals. Every cell contains vitamin C, pro-vitamin A, vitamin B1, vitamin B2, niacin, folic acid, vitamin B12, calcium, zinc, magnesium, iron, protein, and more. In fact, chlorella alone has enough nutrients to support the entire metabolism of a healthy adult. There have been thousands of studies that demonstrate the healthy benefits of chlorella. These studies1,2,3 show chlorella speeds wound healing, relieves digestive problems, boosts immune response, supports your heart and much, much more. The nutrients in chlorella are protected by a thick cell wall that's very hard for humans to digest. And this cell wall has to be opened before your body can absorb any of the nutrients inside. Many companies have special processes for opening the cell walls. The most popular method is milling or grinding. This process breaks the cell wall into small pieces and makes chlorella easier to digest. Unfortunately, it also completely smashes the cell open and exposes the nutrients. And once the nutrients have been exposed, the nutritional value plummets. Other less common ways of opening the cells walls include chemical bleaching and heat-freezing. Chemical bleaching uses chemicals to pre-digest the chlorella or to thin the cell walls. Unfortunately, the chemicals also damage the nutrients. Heat-freezing uses extreme heat and cold to make the cell walls expand and contract. This process opens the walls, but the heat also destroys valuable nutrients. The result of all these processes is that your chlorella supplement is easier to digest, but much of the benefit is lost. So if you've been chewing chlorella tablets by the fistful and you haven't noticed any benefit, this could be the reason why. This German engineering breakthrough uses high frequency sound waves to vibrate the chlorella cells. This intense vibration causes the cell wall to crack, but not collapse. Imagine an egg shell with thousands of tiny cracks on the surface, but still intact. This vibration process deeply fractures the chlorella walls so that they will easily fall apart when they come into contact with water in your body. But because the walls are not broken completely, the nutrients inside the chlorella cells are not harmed. Only one form of chlorella uses this patented vibration process. I'll tell you where you can find it in just a moment. But first, let me tell you about another challenge when manufacturing chlorella supplements. Ironically enough, it has to do with chlorella's amazing detox properties. You see, chlorella is loaded with chlorophyll, and chlorophyll is one of the most powerful detoxification substances in nature. Chlorophyll helps detoxify your liver and bloodstream and helps cleanse your digestive tract. It binds to toxins like a magnet. It can even bind to mercury which is extremely difficult to remove from your body. After 24 hours, the mice that ate the chlorella eliminated significant amounts of mercury compared to the mice who did not receive chlorella. Chlorella's amazing ability to bind toxins also means it can easily pick up toxic metal ions during the manufacturing process. That's why chlorella must be grown and manufactured under exceptionally clean conditions. Some manufacturers grow chlorella in open ponds that are subject to acid rain, pesticide run off, and other environmental toxins. If chlorella comes into contact with any of these toxins during the growing or manufacturing process, it will bind to them. And if the chlorella is already saturated with toxins, it's less able to bind to toxins in your body. It's like a sponge that's so full of water it can't absorb any more. Instead of eliminating dangerous toxins from your body, you end up ingesting more! So before you buy any chlorella supplement, be sure to ask the manufacturer for an independent lab report by a reputable third party. Check to be sure the detected level of mercury and other heavy metal toxins is below 0.01 parts per million (ppm). Don't be fooled by product labels that say "non-detected". You want to know the exact level of heavy metals detected. Some Japanese chlorella has heavy metal levels as high as 20 ppm and it is still considered 'non-detected'! The one chlorella product I trust more than any other offers both the unique sound vibration technology I mentioned earlier and the highest standard of purity. It's called King Chlorella and it's grown under rigid conditions in Taiwan. The scientists who run this lab pay strict attention to detail and the results are one of the purest and most easily digestible forms of chlorella on the market today. After the harvest, the chlorella is tested by two independent labs (one in Pennsylvania, one in California) to ensure it's free of all heavy metals including mercury. As I said before, chlorella offers more valuable healing nutrients than any other super food. So if your diet isn't as good as you wish it could be, chlorella is the perfect way to make sure you get all the vital nutrients you need. Detoxifies Your Body: The chlorophyll in chlorella helps remove dangerous environmental toxins from your body including radioactive residues, pesticides, herbicides, and toxic metals like mercury and aluminum. Helps Slow Aging: Chlorella has the highest concentration of nucleic acids of any food. You may remember nucleic acids from junior high science. They are the stuff that makes up your DNA and RNA. Unfortunately, as you get older your body's ability to synthesize nucleic acids declines, causing your cells to age. But the good news is, your body can absorb nucleic acids directly from chlorella, helping to slow the aging process. Builds Energy: Chlorella also contains more than twice the total protein of beef. 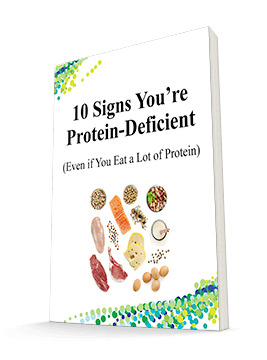 But unlike beef, all of its protein is available for immediate assimilation, giving you a significant energy boost! Together these tiny tablets are a powerhouse of nutritional healing. Best of all, King Chlorella is all natural. There are no synthetic components like you'll find in many grocery store supplements. 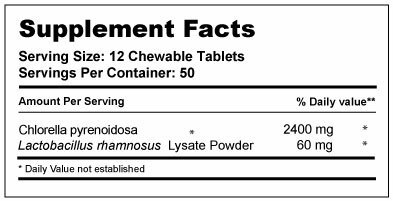 What I also like about King Chlorella is that it contains another one of my favorite immune boosting ingredients: lactobacillus rhamnosus. Lactobacillus rhamnosus is a probiotic that can help build a strong immune system. Studies show it stimulates antibody production and boosts phagocytosis, one of the processes your body uses to destroy foreign invaders. It also increases production of cytokines, important proteins that help regulate your body's immune response. Together chlorella and lactobacillus rhamnosus supports your immune system. And King Chlorella is the only supplement that offers this powerful synergy. I've used chlorella for about 20 years. I regularly tell my patients to take it, and the results have been fantastic. I've seen amazing results in adults who suffer from toxic, immune, circulatory or degenerative problems. Take 8-12 tablets at bedtime. That way the chlorella can work its way through your gut to detoxify your body. 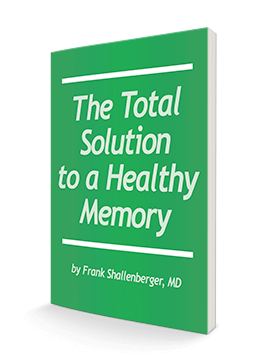 And the chlorella growth factor I mentioned earlier will be available during sleep when your cells are actively repairing themselves. The tablets are very small. You can chew them or swallow them with water. You could also add the green pills to your morning fruit smoothie. As I've always said, the three basic causes of disease are malnutrition, toxins, and stress. Chlorella gives your body a huge nutritional boost in one small super food. It binds toxins in your body and helps eliminate them. And by supporting your body nutritionally, you'll be better able to limit the damaging effects of stress. Why not order King Chlorella today and see for yourself? You Risk Nothing. Your Satisfaction is Guaranteed! I know firsthand how powerful King Chlorella is and we stand by this amazing product. That's why we're putting our money where our mouth is — with our 100% money back guarantee. You risk nothing. Simply try King Chlorella and if you don't agree that it's the purest, most easily digested, most powerful super food you've ever tried, simply send back the empty bottle within 90 days of your purchase and we'll refund you every penny you paid, including shipping and handling. You only pay return shipping. There's no reason not to try this amazing super food today, especially when you can try King Chlorella risk-free. You can get a month's supply of King Chlorella for only $34.95. Plus you are protected by our full money-back guarantee. So you risk nothing at all. I'm confident you'll notice a difference in the first 30 days. In fact, many people tell me they feel an energy boost in just a few days! And because no other food offers the incredible nutritional and health benefits of this tiny single-cell plant, you'll want to take it every day to make sure you get all the nutrition your body needs as well as for ongoing detox and immune support. You have nothing to lose and a mountain of health and nutritional benefits to gain. The abundant nutrients in every cell of chlorella help support wound healing, relieve digestive problems, improve immunity, promote heart health and much, much more. And ordering couldn't be easier. Just follow this link or call 1-800-791-3395 and they'll rush your supply of King Chlorella to you right away. Our helpful consultants are ready to help you 24 hours a day, seven days a week. P.S. As I've always said, the three basic causes of disease are malnutrition, toxins, and stress. Chlorella gives your body a huge nutritional boost in one small super food. It helps bind toxins in your body and eliminate them. And by supporting your body nutritionally, you'll be better able to limit the damaging effects of stress. Try King Chlorella risk-free. Click here to take advantage of this introductory opportunity. ACT NOW! 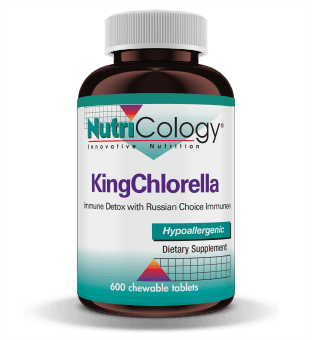 Order Your King Chlorella Today!